This hot (if fleeting) spring weather is getting everyone excited for summer sewing, and for so many of us, that means skirts! We're ready to leave the leggings and layers off and enjoy comfortable, cool cotton. These two skirts Mary has made are just the thing! Made of mid-weight printed cotton, this fabric is often known as "broadcloth," "sheeting," "poplin," or just "quilting cotton." It's simply a plain-weave, crisp, smooth cotton, and as you can see, it's definitely not just for quilting. The smooth surface of plain, stable cotton is ideal for printing, which is why we see such a vast array of beautiful designs on this fabric. Skirts are quick to make, easy to wear, and when made in a bold print, make a great impact in an ensemble. Take advantage of the crisp hand of this type of cotton by choosing full, A-line, or flared styles. The firm fabric will stand away from the body at the hem for great fullness and shape. Come check out all the pretty new cottons now at Treadle! Here's a sweet new group of cotton prints at Treadle. We've seen a lot of lovely, lightweight lawn, but these cotton lawn prints are remarkable for their smallness. A small floral print like these, often called a "ditsy," is a perennial favorite. Florals are always in style, and small prints are easy to wear. These pretty fabrics have a springy warmth and definite vintage appeal. The soft, light weight is ideal for blouses to layer under a soft cardigan, or floaty dresses and skirts to wear all spring and summer long. We recently received the new Oliver + S patterns in our store, and Treadlette Jess has already whipped up a sample of the Pinwheel Tunic! Jess used a sweet cotton print with a small-scale floral design and a contrast binding that pops. When making children's clothes, small-scale designs keep the print from overwhelming the garment, and a sweet pattern like this is a great recipe for cute! We have a couple new viscose suiting fabrics in the store. These pieces are woven with varying size yarns for a rich textural effect, and the viscose fibers lend the fabric a soft drape, so its thick but never bulky. Either of these fabrics would be perfectly classic in a straight skirt or structured jacket. Add a solid-colored silk blouse for a look that's chic, elegant, and perfectly pulled together. We keep a wide variety of colorful and bridal silks in stock at Treadle, as well as unique silk fabrics that you just won't find anywhere else. Here are a few of the most exciting silks that have arrived recently. This multicolored floral design is printed onto crisp silk in a breathtaking shade of blue. This green silk with a large printed leaf design has a smooth drape with a medium body. It would make a gorgeous blouse or dress! This printed silk chiffon is so delicate, the motifs almost disappear over a single layer. But back it with a plain, solid fabric in a coordinating shade, and the design will pop out wonderfully. These are just the teaser; there are many more new silks available in our store! Many of the beautiful Liberty of London cotton lawns we received in January have sold out, but fortunately, we have a lovely new group of fresh printed lawns in stock now! From allover florals to Art Nouveau graphics, Liberty is hard to resist. See these and more at Treadle Yard Goods. We have a fresh crop of new selections in our organic section at Treadle. These owl and bird prints on organic cotton are from Cloud 9 Fabrics. They are crisp and very modern and have an almost Escher-esque quality. The next group is also from Cloud 9 but has a much more whimsical array of critters. Possibly the most exciting are these organic blends: two luscious prints (and a few checks and solids!) in an organic cotton and hemp blend, and a fleece print made from organic cotton blended with recycled polyester. There are dreamy organic cotton jersey solids with just a hint of spandex. And a group of super-soft organic flannels; perfect for projects for baby. Stop by and check out all of our organic fabrics at Treadle! Our sale runs through Sunday 4/14, so there's one more weekend to get 20% off all fabrics and trims in the store! We've just received the new pattern, Laurel, from independent designer Colette in our store. Laurel is a simple shift dress with some sweet details. The straight shape includes side bust darts and vertical back darts for figure-skimming shaping that's not too fitted. The pattern includes optional patch pockets and long gathered cuffs, as well as a pullover blouse option. The simple lines of this pattern make it ideal for stripes, plaids, or large-scale designs, since the lack of intricate seaming lets these types of designs show to their best effect. All Colette patterns come with clear, comprehensive instructions, set up in a book format and stapled into the pattern sleeve (no giant sheets of instructions to wrangle!). Most are drafted with minimal ease, making them much more fitted than your typical commercial pattern, so check your measurements carefully and you'll get a lovely garment that's fitted to your figure. 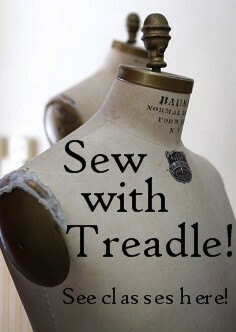 Treadle's Annual Anniversary Sale begins today! Come in April 4th through 14th and receive 20% off all fabrics, ribbons, and trims in the store! Plus, selected groups will be priced at 30-50% off regular price! Join us on Friday, April 5th from 4-6 pm and enjoy mini cupcakes from Cupcake to help us kick off the sale in style. Ready to jump into Spring sewing? The Material Girls have just the class for you! In Blouses Streamlined, you'll use a basic pattern and learn fast, simple techniques to create a garment as nice to wear as it is to sew! Forget the fuss; these streamlined techniques make creating new Spring styles a breeze. Choose one of our beautiful cotton lawns for a stunning addition to your wardrobe. Blouses Streamlined begins next Tuesday, April 9th from 2-4 pm; the second session is April 16th. Call Treadle at 651-698-9690 to register!